This enchanting formula is well known, easy to obtain and cheap. There however are ways to make lots of gold from it, especially if you have enchanting available. I've personally found 3 ways to make this enchant formula profitable. Farming it, learning it and dominating it are all good ways from my experience. There are at least 3 ways to make gold with the Lifesteal enchant! Which one do you prefer? There's 3 ways I've made gold from this enchant. Because Lifestealing enchant formula sells for only a few gold coins usually, option 1 is not efficient on most realms. It's best to buy these from the auction house instead of farming them in Scholomance. 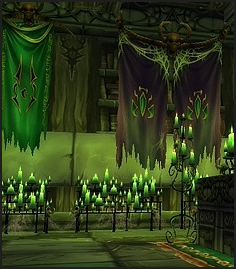 The Formula drops from Spectral Researchers inside Scholomance. It's a high drop rate of 12%, so you don't need to reset the instance multiple times usually. The formula sells for 5-1000 gold. This is a good way to make gold, though it's not very fast. I can usually sell one scroll every few days, but the profits are huge when the reagents are cheap. However, currently I'm monopolizing most of the reagents, so the reagents are worth 4x more than what people would pay for the enchant Scroll itself. Because I have boatloads of reagents, I can safely create scrolls aswell, even though selling the materials would be a bigger profit. Sometimes time is money! I've been selling these scrolls for 400-600 gold. If there's only a few cheap Lifestealing formulae for sale, you should attempt to dominate the Lifestealing market by purchasing them and listing only one at a time for like 500-1000g and lowering the price a bit if someone undercuts you. If more keep popping up, someone is farming them actively so there's no point trying to dominate. The materials are extremely valuable on some realms, so they will each receive a farming post at somepoint where I will let you know the best places to farm them and how to make even more gold with them!